The forgotten army of the land girls tell their story in this new exhibition. During WWII over 75,000 women joined the Women’s Land Army. The heroic image of the land girl standing tall in her corduroy breeches, green jumper has become an iconic symbol of the triumph of wartime agriculture. The exhibition highlights personal stories, propaganda, paintings, posters and photographs. It reveals the experiences of women as they leave their pre-war lives to learn milking, rat catching, threshing and tractor driving. 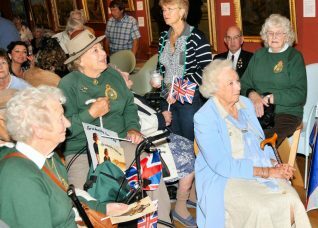 The Land Girls also focuses on the contribution in Sussex. Their headquarters were at Barcombe Place, the land girls were trained at Plumpton Agricultural College and they lived and worked on the Sussex Downs. 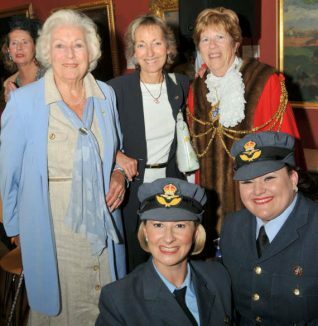 Where are the Land Girls? Were you a Land Girl? Perhaps your mother or grandmother was one of those ‘Cinderellas of the Soil’. Contact Jennifer@mybrightonandhove.org.uk and share your memories with us. We will publish the reminiscences here at My Brighton and Hove, so that our visitors can find out about this sometimes forgotten, but vitally important band of women. In 1941 when I was evacuated to a village in Yorkshire called Burton Leonard, I used to help out on a farm where there was a landgirl. I have forgotten her name but she came from Leeds where her father was a solicitor, and she sometimes took me out in her MG for rides when petrol permitted and when I was finishing off the milking. She and the young farmer used to have a kiss and cuddle in the milking shed. So it wasn’t all hard work. How interesting. My mother along with many women of Mile Oak and Upper Portslade worked the farm land for Farmer Broomfield. I can recall being taken with my brother to the fields, while mum worked we kids played. I have spoken to another kid from those days, unfortunately now deceased. Mum suffered with a bad back for many years, always blaming it on working on the land.